When you see velvet, what it connotes you? A beautiful party dresses? Baroque splendour? Or maybe... upholstery of elegant old furniture? I think, this kind of fabric is perfect also for casual clothes, especially for cooler weather. 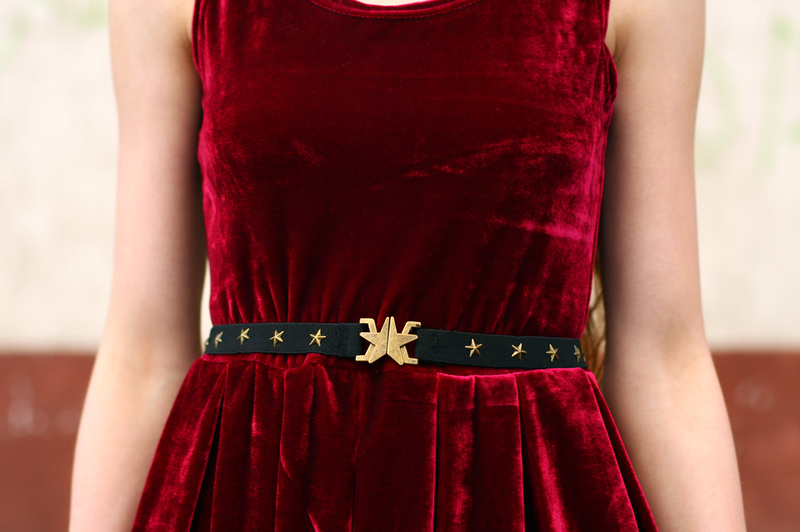 Velvet is warm, soft to the touch and very stylish. My burgundy dress, which I bought last summer at Romwe.com, I decided to match with fine black pantyhose, classic leather pumps and gold jewellery: earrings from H&M and oval ring from Vj-Style.com. Unfortunatelly, the dress was a little to big form my size, but thanks to this original belt with metal stars I was able to hide it. Admittedly all photos were taken in the late September, but just a few modifications let us adjust it to the winter. cudowny post ;) wyglądasz fantastycznie!